Galectin-9 (Gal-9), a member of animal lectins' family, is implicated in the induction of apoptosis in various cancer cells. Here, we evaluated the anti-tumor effect of Gal-9 in OVCAR-3 ovarian cancer cells. The effect of the Gal-9 on cell viability was evaluated using MTT assays. Apoptosis was assessed using Annexin-V staining. The assessment of mitochondrial membrane potential (ΔΨm) was performed using a JC-1 probe. The activity of caspase-3 and caspase-6 were evaluated with colorimetric assay. The production of reactive oxygen species (ROS) was applied by fluorescent probe. The expression levels of Bax and Bcl-2 were assessed using western blotting. The result showed that Gal-9 inhibits cell viability. Flow cytometry analysis showed that Gal-9 induces apoptosis in ovarian cancer cells. Moreover, Gal-9 decreased ΔΨm and increased the generation of ROS and caspase-3 and caspase-6 activities in ovarian cancer cells. Moreover, Gal-9 induced expression of Bax as well as inhibited expression of Bcl-2. In conclusion, our results indicated that Gal-9 induced apoptosis in ovarian cancer cells through mitochondrial pathway. Over the decades, ovarian cancer has become a global challenge in women population all over the world . It has been shown that 225,000 women suffering from ovarian cancer and about 140,000 of them dye from this cancer each year . Despite significant improvement in the treatment for patients with ovarian cancer, it still remains one of the leading causes of cancer-induced mortality in the world . Traditional attempts towards ovarian cancer treatment are commonly followed by the resistance to therapy . Thus, there is a growing need to develop the effective therapy for the ovarian cancer. Disruption of apoptosis is a critical hallmark in biology of cancer . Emerging evidences have revealed that apoptosis induction is one of the important mechanisms of action for many anti-cancer drugs . Therefore, new compounds with potential of apoptosis induction could be reliable tools for effective anti-tumor therapy ,. In this regards, it has been recently suggested that galectin-9 (Gal-9) as a member of family of animal lectins, is involved in various aspects of cancer biology such as proliferation, cell adhesion, metastasis, and apoptosis . Kageshita et al. exhibited that loss of Gal-9 is associated with progression of melanoma cells. Furthermore, overexpression of Gal-9 attenuates metastases in murine melanoma cells, suggesting that increased expression of Gal-9 expression links to a better prognosis in melanoma . Yamauchi et al. reported that Gal-9 has an anti-metastatic effect on breast cancer cells. They also showed that survival ratio for Gal-9-positive patients were better compared with Gal-9-negative group . It has been also shown Gal-9 inhibited the cell proliferation of five myeloma cell lines, and also this effect was mediated by activation of caspase-8, -9, and -3 . Fujita et al. showed that Gal-9 inhibited cell proliferation in hepatocellular carcinoma with induction of apoptosis but did not affect cell cycle arrest, in vitro and in vivo. They also proposed that Gal-9 might be a candidate agent for hepatocellular carcinoma chemotherapy . Another study showed that Gal-9 induces apoptosis through caspase-1 pathway . In addition, Jiang et al. indicated that Gal-9 in the tumor cells may be a critical target to treatment of gastric cancer . Previous studies have also shown the anti-cancer activity of Gal-9 via induction of apoptosis in hematological and gastrointestinal cancer . A previous study showed the expression of Gal-9 in OVCAR-3 ovarian cancer . Taken together, these data propose that Gal-9 could be considered as an appropriate candidate for treatment of some cancers. To the best of our knowledge, data on the role of Gal-9 in ovarian cancer is very scarce. Thus, the purpose of this study was to explore the anti-cancer effects of Gal-9 on OVCAR-3, a human ovarian cancer cell line, to identify the underlying molecular mechanism of its effect. OVCAR-3 cancer cell line was prepared from Pasteur Institute of Iran (Tehran, I.R. Iran). This cell line was grown in RPMI-1640 media supplemented with 10% fetal calf serum 100 U/mL penicillin and 100 mg/mL streptomycin at 37 °C in 5% CO2 air and 95% humid air. The assay was carried out colorimetrically as described previously ,. In brief, after 24 h incubation with Gal-9 (R&D System, USA) at various concentrations (0.1, 1, 10, 25, 50, 75, and 100 nM), MTT dye was added to each well then assessed by microplate reader. Apoptosis was performed by flow cytometry as described previously ,. In brief, cells were seeded and incubated with different concentration of Gal-9 (1, 10, 50, and 100 nM). Cells were collected 48 h later, stained for 15 min with annexin-V-FITC (5 μL) and propidium iodide (5 μL) (eBioscience, USA). The reading of stained events was performed using a FACS Calibur flow cytometer (Tristar, CA, USA) and then analyzed using FlowJo software (Tristar, CA, USA). The inductive effect of Gal-9 in production of reactive oxygen species (ROS) was applied by fluorescent probe 2′, 7′ -dichlorofluorescin diacetate (DCFH-DA) according to manufacturer's instruction (Marker Gene Technologies). Briefly, cells were seeded and treated with various concentrations of Gal-9 (1, 10, 50, and 100 nM) for 48 h, and incubated in dark place with DCFH-DA in Hank's balanced salt solution at 37 °C for 30 min. After washing with Hank's balanced salt solution, ROS levels were assessed by a Synergy HT multi-mode microplate reader (BioTek Instruments, USA). Assessment of caspase-3 and caspase-6 was conducted colorimetrically on the basis of manufacturer's instruction (Biovision, USA). Briefly, cells were cultured overnight and treated with different concentrations of Gal-9 (1, 10, 25, 50, and 100 nM) for 6, 12, 24, 48 and 60 h. Cells then were lysed on ice and supernatants incubated with caspase-3 and caspase-6 substrate. After 1 h incubation at 37 °C, the amount of p-nitroaniline was measured at 405 nm using a microplate reader (BioTek Instruments, USA). The assessment of mitochondrial membrane potential (ΔΨm) of treated OVCAR-3 cells was performed using a JC-1 probe as described previously . OVCAR-3 cells were plated and treatment with different concentrations of Gal-9 (1, 10, 50, and 100 nM). Treated cells were then incubated with JC-1 by (4-(2-hydroxyethyl)-1-piperazineethanesulfonic acid) (HEPES) buffer (40 Mm, pH 7.4) containing 0.65% NaCl and 2.5 mM JC-1. Fluorescence was measured using a Synergy HT multi-mode microplate reader (BioTek Instruments, USA) at two excitation/emission wavelength pairs. The ratio between the measured red (590 nm) and green (540 nm) fluorescence intensities indicated alteration in ΔΨm. The Bax and Bcl2 protein were determined by immunoblotting assays as described previously ,. The cells were treated with different concentrations of Gal-9 (1, 50, and 100 nM) for 48 h. Prepared lysates at 30-50 μg amounts were subjected to SDS-PAGE and transferred onto polyvinylidene difluoride (PVDF) membrane. Membranes were then stained with mouse monoclonal antibodies Bcl2, Bax, and GAPDH antibodies (Santa Cruz and dilution 1:1000 ) overnight at 4 °C, and washed three times (each for 15 min) with phosphate buffered saline-tween. Membranes were incubated with goat anti-mouse IgG-HRP as secondary antibodies (Santa Cruz and dilution 1:10000) for 1 h at room temperature. The proteins contents were determined with ECL detection reagent (Biorad, USA). One-way analysis of variance (ANOVA) was carried out with the Dunnett's test using software SPSS version 16. P < 0.05 was considered significant. We first evaluated the anti-proliferative effect of Gal-9 on OVCAR-3 human ovarian cancer cell line by MTT assay. Our results showed that the cell proliferation is inhibited after exposure to Gal-9 in a dose dependent manner (P < 0.05). As shown in [Figure 1], a significant anti proliferative effect was observed at 1 nM reaching maximum at 100 nM with 9.6 % and 33.8% decreasing cell viability compared to untreated normal control, respectively. The IC50 of Gal-9 was found to be 148.45 nm. Figure 1: Cytotoxicity effect of galectin-9 (Gal-9) on OVCAR-3. Cells were treated with different concentrations of Gal-9 for 48 h, and cytotoxicity was assessed by MTT assay. Gal-9 reduced cell viability in a dose dependent manner. Results (mean ± SD) were calculated as percent of control values. *P < 0.05 is considered significant. Our results presented in [Figure 2]A, [Figure 2]B, [Figure 2]C, [Figure 2]D, [Figure 2]E indicated that the percentage of the apoptotic cells were 1.411%, 10.72%, 18.67%, 21.85%, and 30.69% for control cells, 1, 10, 50, and 100 nM, respectively. As shown in [Figure 2]F after 48 h exposure to Gal-9 the incidences of apoptotic cells were increased in a concentration-dependent manner (P < 0.05). Figure 2: Flow cytometric analysis of apoptosis induced by galectin-9 (Gal-9) in OVCAR-3. A-E, Cells were treated with various concentrations of Gal-9 (0, 1, 10, 50, and 100 nM, respectively) for 48 h and followed by apoptosis detection by annexin-V and propidium iodide using flow cytometry; F, after treatment with Gal-9 apoptosis gradually increased in OVCAR-3 ovarian cancer cells. *P < 0.05 is considered significant. Increase of ROS production could be one of the factors inducing cell apoptosis . As shown in [Figure 3], the level of ROS in OVCAR-3 cells were 1.21, 1.34, 1.42, and 1.51 folds after 48 h exposure to 1, 10, 50, and 100 nM of Gal-9, respectively. These findings showed that the amount of ROS in Gal-9-treated cells were significantly higher compared with control cells (P < 0.05). Figure 3: Intracellular reactive oxygen species (ROS) level in galectin-9 (Gal-9) treated OVCAR-3 cells. The cells were incubated with various concentrations of Gal-9 (0, 1, 10, 50, and 100 nM) for 48 h and the ROS levels monitored by DCFH-DA staining. The fluorescence intensity was analyzed by a microplate reader at an excitation wavelength of 485 nm and an emission wavelength of 528 nm, respectively. *P < 0.05 is considered significant. As shown in [Figure 4]A and [Figure 4]B, Gal-9 activated caspase-3 and caspase-6 in a concentration (1-100 nm) and time-dependent manner. Ccaspase-3 and caspase-6 were activated with Gal-9 in a time (6-60 h)-dependent manner in comparison with untreated cells (P < 0.05) [Figure 4]C and [Figure 4]D. These data suggest that Gal-9 induces OVCAR-3 cell apoptosis through caspase-3 and caspase-6. Figure 4: The effect of galectin-9 (Gal-9) on caspase activity in OVCAR-3. The cells treated with various concentrations of Gal-9 and the activation of caspase-3 and caspase-6 were assayed enzymatically. 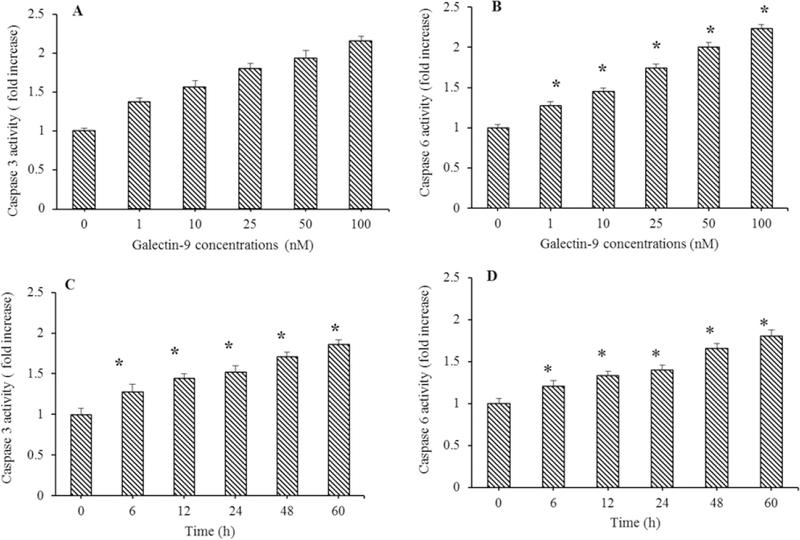 A, Gal-9 activated caspase-3 and B, caspase-6 in a concentration (1-100 nM)-dependent manner, and also C, activation of caspase-3 and D, caspase-6 were obtained with Gal-9 (25 nM) corresponding to time (6-60 h)-dependent manner compared with untreated cells (*P < 0.05). We used the JC-1 probe, a cationic dye exhibiting potential-dependent accumulation in the mitochondria, to determine the ΔΨm reduction in OVCAR-3 cells after treatment with various concentration of Gal-9. As shown in [Figure 5]A, a significant dose-dependent decrease in ΔΨm occurred after treatment with Gal-9 (P < 0.05). Figure 5: Effects of galectin-9 (Gal-9) on mitochondrial membrane potential (ΔΨm), Bcl-2 and Bax expression in human ovarian OVCAR-3 cells. A, after incubation of cells with different concentrations of Gal-9 for 48 h, cells were loaded with JC-1 dye and the potential-dependent accumulation in the mitochondria measured directly. B, cells were treated with different concentration of Gal-9 and then Bcl-2 and Bax expressions were analyzed by western blots using the corresponding specific antibodies. Intensity of each band, C, Bcl2 and D, bax was estimated by imageJ software. Equal sample loadings were confirmed by GAPDH band manner compared with untreated cells (*P < 0.05). In order to confirm the apoptotic effects of Gal-9, western blot analysis of both Bax and Bcl-2 was carried out in OVCAR-3 cancer cells in the presence of various concentrations of Gal-9 (1, 50, 100 nM). In this regard, our results showed that Gal-9 incubation decreased the expression level of Bcl-2 dose dependently but it increased the expression level of Bax in a dose dependent fashion [Figure 5]B. As shown in [Figure 5]C, Bcl-2 protein decreased 1.96, 3.69, and 27.3 folds for 1, 50, and 100 nM, respectively (P < 0.05). Moreover, as shown in [Figure 5]D Bax protein increased 6.1, 14.2, and 23.1 folds for 1, 50, and 100 nM, respectively (P < 0.05). Despite recent advances in the treatment of ovarian cancer, its incidence and mortality rates are still high. Therefore, like other cancers, development of new compounds for treatment of human ovarian cancer is strongly recommended. Numerous studies have revealed that Gal-9 modulates cell growth in various cancer cell lines ,. However, the antitumor effect of Gal-9 has not been evaluated in ovarian cancer. The main aim of our study was to investigate the anticancer and apoptotic induction properties of Gal-9 on the human ovarian cancer cell, and the possible mechanism of its action. Our data showed Gal-9 led to a dose-dependent inhibition of cell growth in ovarian cancer cell line, OVCAR-3. This data suggests that Gal-9 would be an effective treatment for ovarian cancer. One of the most important features of apoptosis is the externalization of phospholipid phosphatidylserine by changing of its localization from the inner to the outer layer of cellular membrane during the early stage of apoptosis . Parallel to other features of apoptosis, annexin-V which stains phosphatidylserine, exhibited apoptosis of OVCAR-3 cells induced by Gal-9 in a dose dependent manner. In accordance with these findings, it was reported that Gal-9 inhibits cell proliferation and induces apoptosis in myeloma cell lines . Another study indicated that Gal-9 inhibits the proliferation of hepatocellular carcinoma by apoptosis . Generally it has been accepted that apoptosis is associated with a wide variety of morphological and biochemical aspects that are used to distinguish apoptotic cell death. Several studies demonstrated the expression levels of anti-apoptotic protein Bcl-2 and pro-apoptotic proteins Bcl-2 are important biochemical markers of apoptosis ,. During early stage of apoptosis, the transcriptional expression of Bcl-2 and Bax are suddenly impaired, which leads to increase of Bax/Bcl-2 ratio ,. The results of this study demonstrated that Gal-9 decreased the expression of Bcl-2 and increased the expression of Bax in a dose dependent manner. These data suggest that the anti-proliferative effect of Gal-9 is mediated via apoptosis. A study has shown that Gal-9 inhibits the growth of hepatocellular carcinoma via apoptosis . Furthermore, emerging evidence has shown that the increase in Bax/Bcl-2 ratio leads to mitochondrial deregulation . Mitochondria are generally accepted to act as central organelle in the apoptotic process . Reduction of ΔΨm seems to be a sign of mitochondrial dysfunction which usually occurres in early apoptosis . Our findings in the present study showed Gal-9, dose-dependently, triggered the loss of ΔΨm in cells. In addition, an increase in Bax/Bcl-2 ratio leads to mitochondria-dependent apoptosis by releasing cytochrome c from mitochondria into the cytosol which leads to caspase activation . Caspase-3 and caspase-6 are considered as executioner caspases in apoptosis . In the present study we showed that Gal-9 treatment significantly increased caspase-3 and caspase-6 activation in a dose-dependent fashion. Therefore, collapse of ΔΨm and caspase-3 and caspase-6 activation, suggests an induction of mitochondrial-dependent apoptosis in Gal-9 incubation. Wide varieties of anti-tumor reagent generally rely on their ability to stimulate intracellular ROS production. Increased content of intracellular ROS can destroy the integrity of cellular membrane, impairing proteins, affecting dynamic of cytoskeleton, and affecting nucleotide caused to DNA damage, totally known as oxidative stress . Excessive intracellular ROS production by several features such as disrupting ΔΨm has been shown to induce apoptosis . For instance, Le Bras et al. exhibited that loss of mitochondrial membrane integrity leads to the release of mitochondrial pro-apoptotic elements, pro-caspase activation, and DNA damage . The current study showed that Gal-9-induced ROS formation in OVCAR-3 cells confirmed that Gal-9 incubation leads to apoptosis induction in OVCAR-3 human ovarian cancer cells. Taken to gather, our data indicated that Gal-9 inhibited cell proliferation in OVCAR-3 cancer cells by increasing ROS which led to a decrease in the protein expression of Bcl-2 followed by an increase in Bax protein expression, then a decrease in ΔΨm, leading to an increase in the protein expression of caspase-3 and caspase-6 and the induction of the apoptosis of OVCAR-3 cancer cells. The content of this paper is extracted from a Pharm. D thesis (No. 394230) submitted by Ali Nazri which was financially supported by Vice Chancellor of Isfahan University of Medical Sciences, Isfahan, I.R. Iran. Reid BM, Permuth JB, Sellers TA. Epidemiology of ovarian cancer: a review. Cancer Biol Med. 2017;14(1):9-32. Bowtell DD, Böhm S, Ahmed AA, Aspuria PJ, Bast Jr RC, Beral V, et al. Rethinking ovarian cancer II: reducing mortality from high-grade serous ovarian cancer. Nat Rev Cancer. 2015;15(11):668-679. Hajiahmadi S, Panjehpour M, Aghaei M, Mousavi S. Molecular expression of adenosine receptors in OVCAR-3, Caov-4 and SKOV-3 human ovarian cancer cell lines. Res Pharm Sci. 2015;10(1):43-51. Fujita K, Iwama H, Oura K, Tadokoro T, Samukawa E, Sakamoto T, et al. Cancer therapy due to apoptosis: galectin-9. Int J Mol Sci. 2017; 18(1):74-88. Vergote IB, Marth C, Coleman RL. Role of the folate receptor in ovarian cancer treatment: evidence, mechanism, and clinical implications. Cancer Metastasis Rev. 2015;34(1):41-52. Fisher DE. Apoptosis in cancer therapy: crossing the threshold. Cell. 1994;78(4):539-542. Ghobrial IM, Witzig TE, Adjei AA. Targeting apoptosis pathways in cancer therapy. CA Cancer J Clin. 2005;55(3):178-194. Wiersma VR, de Bruyn M, Helfrich W, Bremer E. Therapeutic potential of Galectin-9 in human disease. Med Res Rev. 2013;33(Suppl 1): E102-E126. Kageshita T, Kashio Y, Yamauchi A, Seki M, Abedin MJ, Nishi N, et al. Possible role of galectin-9 in cell aggregation and apoptosis of human melanoma cell lines and its clinical significance. Int J Cancer. 2002;99(6):809-816. Yamauchi A, Kontani K, Kihara M, Nishi N, Yokomise H, Hirashima M. Galectin-9, a novel prognostic factor with antimetastatic potential in breast cancer. Breast J. 2006;12(5 Suppl 2): S196-S200. Kobayashi T, Kuroda J, Ashihara E, Oomizu S, Terui Y, Taniyama A, et al.Galectin-9 exhibits anti-myeloma activity through JNK and p38 MAP kinase pathways. Leukemia. 2010;24(4):843-850. Fujita K, Iwama H, Sakamoto T, Okura R, Kobayashi K, Takano J, et al. 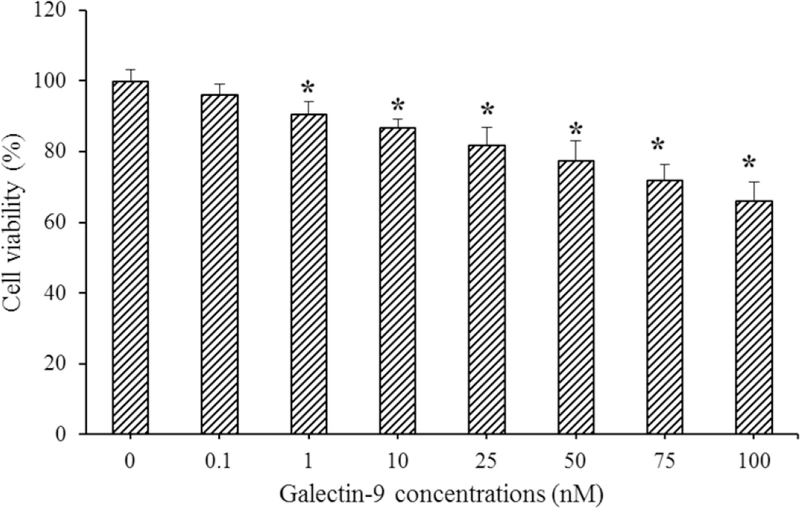 Galectin-9 suppresses the growth of hepatocellular carcinoma via apoptosis in vitro and in vivo. Int J Oncol. 2015;46(6): 2419-2430. Kashio Y, Nakamura K, Abedin MJ, Seki M, Nishi N, Yoshida N, et al. 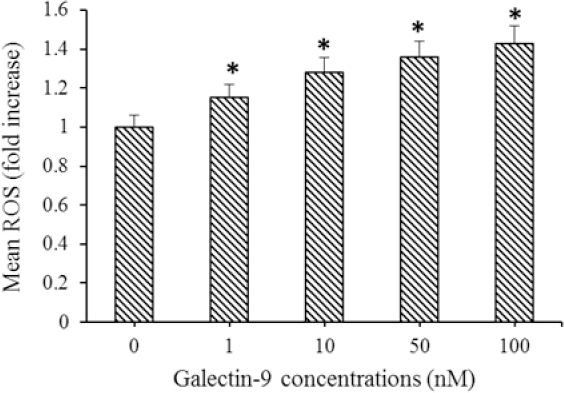 Galectin-9 induces apoptosis through the calcium-calpain-caspase-1 pathway. J Immunol. 2003;170(7):3631-3636. Jiang J, Jin MS, Kong F, Cao D, Ma HX, Jia Z, et al. Decreased galectin-9 and increased Tim-3 expression are related to poor prognosis in gastric cancer. PLoS One. 2013;8(12):e81799. Lahm H, Andre S, Hoeflich A, Fischer JR, Sordat B, Kaltner H, et al. Comprehensive galectin fingerprinting in a panel of 61 human tumor cell lines by RT-PCR and its implications for diagnostic and therapeutic procedures. J Cancer Res Clin Oncol. 2001;127(6):375-386. Joshaghani HR, Jafari SM, Aghaei M, Panjehpour M, Abedi H. A3 adenosine receptor agonist induce G1 cell cycle arrest via Cyclin D and cyclin-dependent kinase 4 pathways in OVCAR-3 and Caov-4 cell lines. J Cancer Res Ther. 2017;13(1):107-112. Nabatchian F, Moradi A, Aghaei M, Ghanadian M, Jafari SM, Tabesh S. New 6 (17)-epoxylathyrane diterpene: aellinane from Euphorbia aellenii induces apoptosis via mitochondrial pathway in ovarian cancer cell line. Toxicol Mech Methods. 2017;27(8):622-630. Jafari SM, Panjehpour M, Aghaei M, Joshaghani HR, Enderami SE. A3 adenosine receptor agonist inhibited survival of breast cancer stem cells via GLI-1 and ERK1/2 pathway. J Cell Biochem. 2017;118:2909-2920. Shahali A, Ghanadian M, Jafari SM, Aghaei M. Mitochondrial and caspase pathways are involved in the induction of apoptosis by nardosinen in MCF-7 breast cancer cell line. Res Pharm Sci. 2018;13(1):12-21. 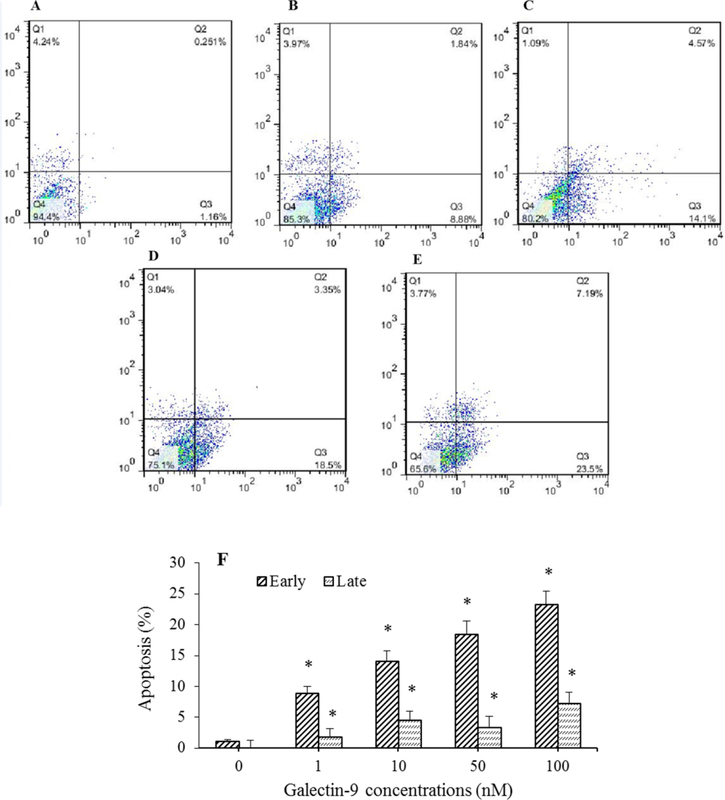 Jafari SM, Panjehpour M, Aghaei M, Joshaghani HR, Zargar Balajam N. Apoptosis and cell cycle regulatory effects of adenosine by modulation of GLI-1 and ERK1/2 pathways in CD44+ and CD24− breast cancer stem cells. Cell Prolif. 2017;50(4):e12345. Jafari SM, Joshaghani HR, Panjehpour M, Aghaei M. A2B adenosine receptor agonist induces cell cycle arrest and apoptosis in breast cancer stem cells via ERK1/2 phosphorylation. Cell Oncol (Dordr). 2018;41(1):61-72. Poupel F, Aghaei M, Movahedian A, Jafari SM, Shahrestanaki MK. Dihydroartemisinin induces apoptosis in human bladder cancer cell lines through reactive oxygen species, mitochondrial membrane potential, and cytochrome C pathway. Int J Prev Med. 2017;8:78-84. Aghaei M, Karami-Tehrani F, Panjehpour M, Salami S, Fallahian F. Adenosine induces cell-cycle arrest and apoptosis in androgen-dependent and -independent prostate cancer cell lines, LNcap-FGC-10, DU-145, and PC3. Prostate. 2012;72(4):361-375. Tadokoro T, Fujihara S, Chiyo T, Oura K, Samukawa E, Yamana Y, et al. Induction of apoptosis by Galectin-9 in liver metastatic cancer cells: In vitro study. Int J Oncol. 2017;51(2):607-614. Seki M, Oomizu S, Sakata KM, Sakata A, Arikawa T, Watanabe K, et al. Galectin-9 suppresses the generation of Th17, promotes the induction of regulatory T cells, and regulates experimental autoimmune arthritis. Clin Immunol. 2008;127(1):78-88. Chaurio RA, Janko C, Muñoz LE, Frey B, Herrmann M. Gaipl US. Phospholipids: key players in apoptosis and immune regulation. Molecules. 2009;14(12):4892-4914. Chang CH, Zhang M, Rajapakshe K, Coarfa C, Edwards D, Huang S. Mammary stem cells and tumor-initiating cells are more resistant to apoptosis and exhibit increased DNA repair activity in response to DNA damage. Stem Cell Reports. 2015;5(3):378-391. Yip KW, Reed JC. Bcl-2 family proteins and cancer. Oncogene. 2008;27(50):6398-6406. Naseri MH, Mahdavi M, Davoodi J, Tackallou SH, Goudarzv and M, Neishabouri SH. Up regulation of Bax and down regulation of Bcl2 during 3-NC mediated apoptosis in human cancer cells. Cancer Cell Int. 2015;15:55-63. Henry-Mowatt J, Dive C, Martinou JC, James D. Role of mitochondrial membrane permeabilization in apoptosis and cancer. Oncogene. 2004;23(16):2850-2860. Ly JD, Grubb DR, Lawen A. The mitochondrial membrane potential (deltapsi(m)) in apoptosis; an update. Apoptosis. 2003;8(2):115-128. Wang C, Youle RJ. The role of mitochondria in apoptosis. Annu Rev Genet. 2009;43:95-118. Molavian HR, Goldman A, Phipps CJ, Kohandel M, Wouters BG, Sengupta S, et al. Drug-induced reactive oxygen species (ROS) rely on cell membrane properties to exert anticancer effects. Sci Rep. 2016;6. Article number:27439. Marchi S, Giorgi C, Suski JM, Agnoletto C, Bononi A, Bonora M, et al. Mitochondria-ros crosstalk in the control of cell death and aging. J Signal Transduct. 2012;2012. Article ID:329635. Le Bras M, Clement MV, Pervaiz S, Brenner C. Reactive oxygen species and the mitochondrial signaling pathway of cell death. Histol Histopathol. 2005;20(1):205-219.